Based on Dean’s twenty plus years of ethnographic fieldwork, Bored in Heaven is divided into five distinct chapters. These cover the God of Theater, ritual processions, Taoist rites, spirit mediums, and rituals, with a short Introduction and Conclusion. 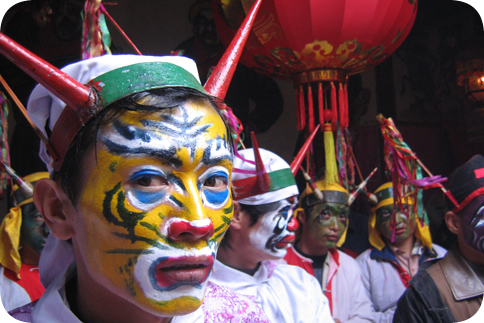 Dean uses footage from various local village religious festivals taking place during the Chinese New Year season across the Putian plain of Southeast China. The religious revival of local religion, Dean argues, began with overseas Chinese from Southeast Asia returning to Putian in the mid-1980s to invest in temple construction and ritual performances. Currently, this religious revival is flourishing publicly in a vexing relationship to official State-sponsored religiosity. China’s re-enchantment with local popular religious expression beckons a fundamental reconsideration of the interplay between modernity, secularization, global capitalism, politics, and the power of local popular religiosity in the lives of people as it reenters the public sphere. The future of this revival is suggested by the large numbers of children and teenagers who participate in the village festivals, as devotees and pilgrims, and by religious specialists operating in the form of mediums. Some teens also expressed a direct link between economic and material success in modern China with participation in religious rituals. The title of the film, Bored in Heaven, is taken from the story of the God of Theater himself, who according to legend, is third son of the Jade Emperor. Due to the endless bureaucracy in heaven, he is dreadfully bored. He sees humans, especially women, having more fun on earth, so he transforms himself into human form and engages humanity through ritual processions, and the trances of spirit mediums or performers/actors, who portray him in opera or puppet theater throughout the Chinese New Year. These religious revivals are in turn producing new rituals, employing the use of modern luxury goods, and connecting young and old, domestic and overseas Chinese believers. While Bored in Heaven primarily focuses on the God of Theater, many other gods and goddesses appear as guest actors in the various rituals portrayed on the screen. Pedagogically, Bored in Heaven provides powerful images and sounds of Chinese religious expression. Individual chapters may be shown separately to supplement reading materials and classroom discussions, especially within a 60 minute class period. The film is ideal for an advanced college course or graduate seminar on Taoism or Chinese religion, but would also be useful in a class on contemporary China or comparative religion as well. Jonathan H. X. Lee is Assistant Professor of Asian American Studies San Francisco State University. He holds a Ph.D. in religious studies and has published widely on Chinese, Cambodian, Vietnamese, and Chinese-Southeast Asian American histories, folklore, cultures, and religions. Lee is the Program Co-chair of the Religions of Asia section for the American Academy of Religion, Western Region (AAR/WR) conference. Institutional price for DVD is $150.00; Bluray is $175.00. Instiutional copies have full public performance rights, and can be shown in classes of any size.